Some of the most seductive things in life take only two bites: one to start, and a second that leaves you wanting more. 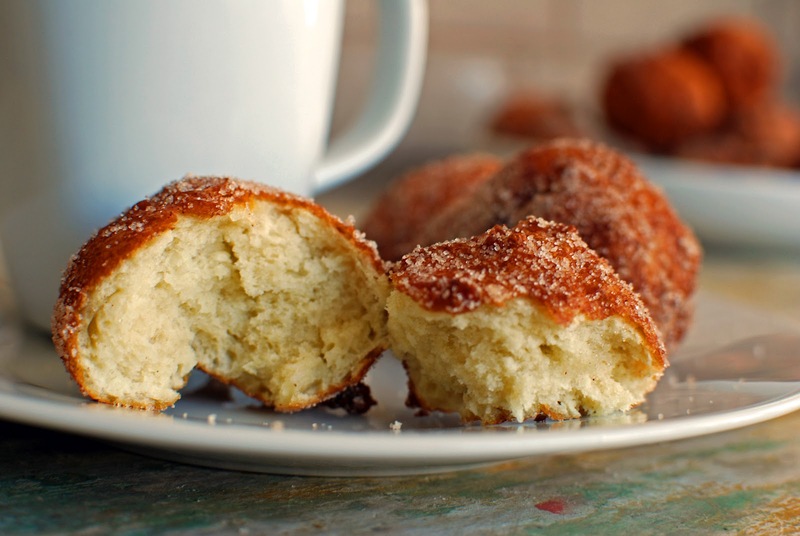 Luckily, this recipe for Cinnamon-Sugar Doughnut Bites makes enough to 'start again' as many times as you like. These highly addictive doughnuts are also made for sharing: I knocked on my neighbour R.'s door with a plateful of them, which prompted him to text his wife boastingly about what she was missing out on. She made him text her photos of the doughnuts periodically to ensure there were still some there when she came home! 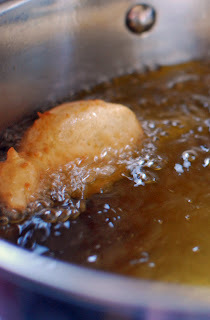 From Berliner to Zeppole, it seems every culture has a version of sweet, fried dough. In 1847, sixteen-year-old American Navy Capt. Hanson Gregory came up with a simple idea that revolutionized this cross-cultural indulgence. Looking for a way to lessen the greasiness of other doughnut shapes common at the time, Gregory ingeniously used the bottom of his ship's tin pepper box to cut a hole in the centre of a disk of dough. In an interview with the Washington Post, Gregory was asked if he was pleased with his discovery: "Was Columbus pleased?" he quipped. But what to do with the leftover dough? Frugality met genius and the doughnut hole (the 'best part') was invented. 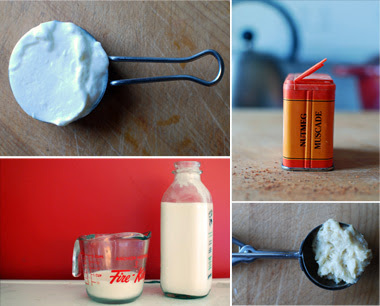 Buttermilk, plain yogurt (I used my go-to Astro Balkan-Style), sugar, flour, baking soda, and an egg are combined and accented with just a hint of nutmeg. The dough rests while the oil heats up, and can even be made the night before. Balls of dough are measured out with an ice cream scoop and carefully placed into the hot oil to bathe until golden. The weight of the uncooked dough causes the doughnuts to flip over on their own, which is an excellent example of how food 'speaks' for itself - all you have to do is pay attention to what it is telling you. The crisp and golden doughnuts are then scooped out of the oil with a slotted spoon and coated generously with vanilla sugar and cinnamon. It is impossible not to eat one at this point. The hot, crunchy exterior is lustily (lustily!) broken open to reveal a cakey dough, steamy with nutmeg. 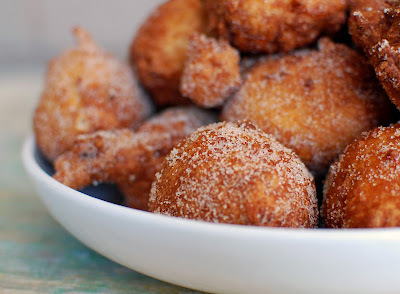 The cinnamon-sugar sticks to your fingers, which you happily lick clean in anticipation of picking up another one. Of course, in the particularly indulgent mathematics of my kitchen boudoir, 'one' equals any number of my choosing. Enjoy! add to yogurt mixture, stirring until just blended. Let sit while oil heats. tablespoons, drop scoops of dough into the hot oil. Let brown for about a minute or two - the weight of the uncooked dough will naturally flip the doughnut over when it's ready, although some oddly-shaped doughnuts might need a bit of coaxing. Remove dough with tongs or a slotted spoon and drain on a paper towel. Combine vanilla sugar and cinnamon in a large bowl or paper bag. Add the fresh doughnuts and shake or toss to coat. These are delicious served warm or at room temperature. These look amazing. I'd definitely eat them all at once! Thanks! I brought these into work so I didn't cave to that very temptation. oh gosh, I may have to try this. Where do you get vanilla sugar? Hey Katherine - you can easily make it yourself! Simply make something delicious with a vanilla bean, then store the scraped shell in a mason jar or sealed container with your sugar. It will perfume it beautifully, adding a sweet yet subtle layer of flavour to your baked goods. I use it in all of mine.